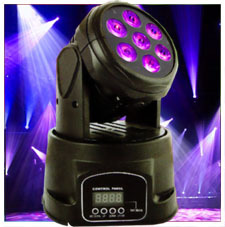 This Moving head light fixture with standing yoke has a rich effect program and shows simplicity in operation. You can use its built-in automated and sound-activated programs and variable speed-pulse effect for use on the fly. It also offers static colors and RGBW color mixing with or without DMX and built-in power linking for quick set up and break down. There are 5 working modes. • RGBA/W - Red, Green, Blue, Amber/White. • DMX-512: 7 or 12 Channel. • Dimensions: 24X13X24cm / 6x6.5x9" inches.